The first question folks ask me (after "Do you really live in the desert?") is "what are the best hikes to do when visiting Joshua Tree National Park?" Here are my top 5 hikes-- there's something for every level of hiker. North View Trail in Joshua Tree National Park at sunrise. Photo by Lindsay Hollinger. Gorgeous sweeping views, solitude, and a good cardio workout make this my favorite hike in the park. The trail is well marked and easy to follow, and takes you through sandy washes and large tumbling rock formations. A little rock scrambling, a good uphill climb, and close proximity of the trailhead to the Park Boulevard (west) entrace make this hike super fun, convenient, and moderately difficult. If you are adventurous, do this hike at sunrise. You will be hiking just as the first rays peak over the rocks and it is a sight more magical than any words can express. If you have time, make it longer and add a loop through the Maze and Window Rock trails. Directions and a concise summary of the trail are here. The Lost Horse Mine Loop trail in Joshua Tree National Park. Photo by Lindsay Hollinger. I love this hike because you get to see lots of different types of landscape, and hike through some giant Joshua Trees. It is a moderate rolling hike with some uphill stretches, and walking on rocky and sandy trail. The trail is well marked and there's a board with info about the mine at the trailhead. The section goes up an old mining "road"-- it is mind-blowing to imagine riding in a wagon up that trail (how did they do it?) and takes you through a burn area and then to the Lost Horse mine. You will see first-hand the trauma a fire can cause, and how the desert landscape slowly recovers. Above the mine, you can scramble up the rocks to the summit of the hill, and be rewarded with 360 degree sweeping views of the park. From there, head back to the trail and continue the loop as it heads down and around into the sandy washes with the big Joshuas and yuccas. Keep an eye out for jackrabbits! Directions and a concise summary of the trail are here. 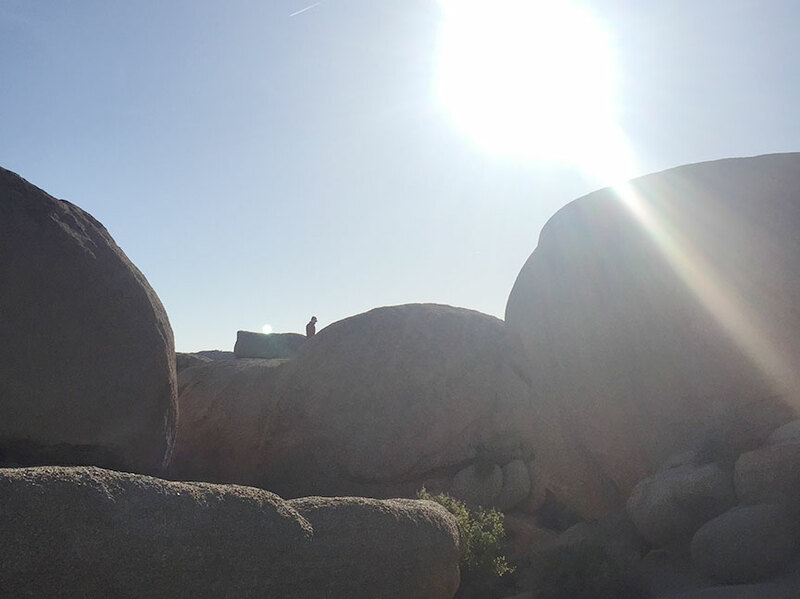 Hikers are rewarded for their efforts with sweeping vistas at the top of Ryan Mountain in Joshua Tree National Park. Photo by Lindsay Hollinger. Short, sweet, and and strenuous. This hike is categorized "moderate" but I call it "difficult" because of the elevation gain. It's only about a mile and a half to the top of Ryan Mountain, but you gain about 1,000 feet of elevation while you're hiking. It's a pretty good workout, and you will see lots of people on the trail, as it's one of the more popular hikes in the park. The trail is well-worn and gives you an excellent view from the top. It's a great spot to bring a snack or picnic as your reward for making it to the summit! Directions and a concise summary of the trail here. 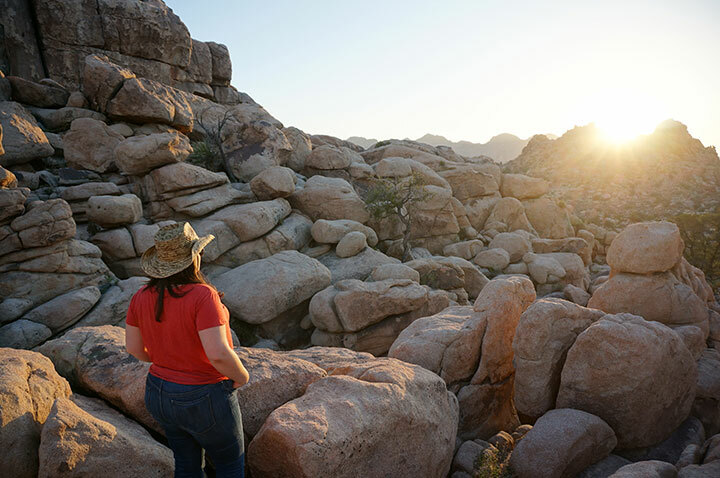 Hidden Valley Nature Trail is spectacular at sunset in Joshua Tree National Park. Photo by Lindsay Hollinger. Hidden Valley is an excellent hike to do with children or those who would prefer a relaxed hike. The one-mile loop trail is marked along the way with information about wildlife and the history of the valley, and offers views of majestic rock formations. You will often see climbers perched atop the craggy rocks surrounding the valley. The path is mostly sand and gravel, with some rock steps. Kids can scramble around on the rocks to their hearts' content, while you have a snack and sun yourself on one of the many big boulders. At sunset, the light pours through the valley and creates a spectacular show, I highly recommend a visit at the end of the day. DIrections and a concise summary of the trail here. Pine City Trail offers some excellent rock scrambling on some of the largest boulders around. Photo by Lindsay Hollinger. Named for the Piñon Pines that grow along the trail, the hike to Pine City is a rolling easy trek through mostly flat open vistas with lots of desert flora. It's a real treat for plant nerds like me! You'll see some of the best examples of mojave desert plants the park has to offer. After rolling through the washes for awhile, you will come upon a large gathering of gigantic boulders, spotted with pines (you're reached Pine City!). The rocks hold the moisture and cool air that allows the trees to thrive. Scramble around on the rocks and enjoy the echos off the boulders. After a stop at the boulders, continue past Pine City- the trail leads up to an overlook of the Oasis Visitor center in the distance below. Enjoy some time at the vista before retracing your steps back to the trailhead. Directions and a concise summary of the trail here. 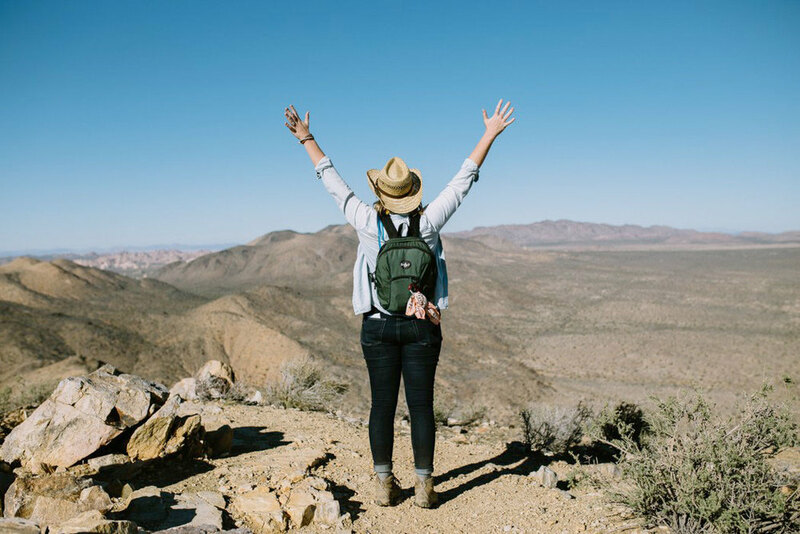 Be sure you take a map, plenty of water, snacks, sunscreen, sunglasses, and a hat when hiking in Joshua Tree National Park. I recommed bringing at least 2L of water per person (or more, depending on how long you plan to hike). Between May and October, it is extremely hot and dangerous during midday, so save your hiking for sunrise and sunset, and take a siesta during the afternoon heat. One bottle of water won't cut it! Bring extra water, because dehydration and heat stroke are no laughing matter. Alternately it can be cold from early October through early May, especially when the sun starts to set, so bring a windbreaker or extra layer. Always follow the Leave No Trace principles- caring for our precious outdoor resources is everyone's responsibility, and you are responsible for your own safety. Take only memories, leave only footprints. 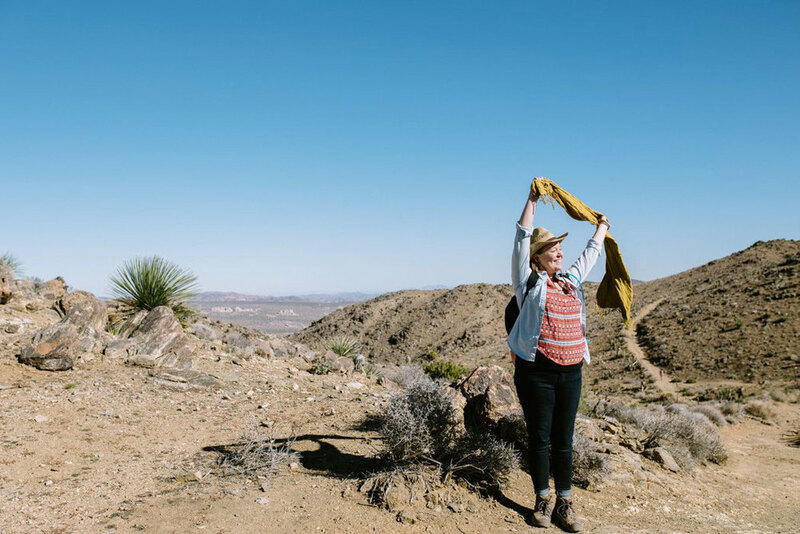 Hiking Joshua Tree National Park is one of the best experiences if you come prepared. Don't forget your hat (scarf optional). Photo by Ryan Tuttle. My favorite map is National Geographic Illustrated Trails Map of Joshua Tree and my favorite hiking books about Joshua Tree are On Foot In Joshua Tree National Park and Best Easy Day Hikes in Joshua Tree. All can be purchased at the JTNP Park Store, Coyote Corner, or on Amazon, and I also have copies of each at Casa Joshua Tree for guests to use. Special thanks to Modern Hiker for all the wonderful recaps and directions. The end of the Lost Horse Mine Loop lets out in a wash full of beautiful Joshua Trees. Photo by Lindsay Hollinger.